The JVC LC-2J Dual Charger for SSL-JVC50 7.4V Batteries can simultaneously charge two SSL-JVC50 7.4V batteries. SSL-JVC50 batteries are JVC-packaged IDX batteries for the GY-HMQ10, HM600, and HM650 JVC camcorders. 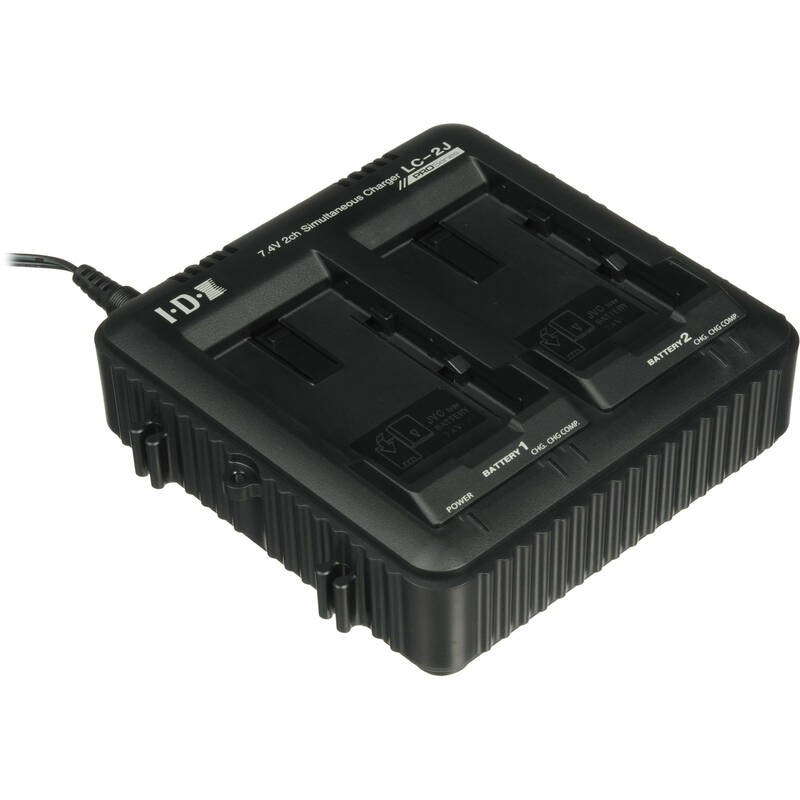 Box Dimensions (LxWxH) 8.7 x 6.95 x 3.0"
LC-2J Dual Charger for SSL-JVC50 7.4V JVC Batteries is rated 4.3 out of 5 by 17. Rated 5 out of 5 by Hugh D. from JVC should have included a battery charger in original purch I have no complaint about the LC-2J dual charger. It works fine. My problem is with JVC selling a camera system with a rechargeable camera battery and no external charger in the package. Rated 5 out of 5 by alcon4444 from Highly Priced. Works; better work. The charger works great. Very light in weight and solid built so it can withstand rough handling, as indicated by previous reviews. Although someone mentioned it can charge up to four batteries when attached to another unit, well each unit needs their own power supply. I would like to make a -5 star on the manufacturer since the price for this charger is ridiculously high and DOES NOT COME WITH A POWER SUPPLY. Since BH does a great job with describing their products, I can't complain against them. It is not a JVC charger, however the product is advertised as a JVC charger, the image is accurate though. It's made by IDX. I hope some other company soon comes into competition so we can all benefit on the price drops. Cheers everyone! Happy shooting. Rated 4 out of 5 by Jeffrey from Don't make your camera a charger! If you have extra batteries, you really need a way to charge them without tying up the camera. The LC-2J will charge up to two batteries at a time completely automatically, so you don't need to worry about how long you leave them on the charger. Lights for each side of the charger give you an idea of the charging progress -- there's also a fault warning if the charger thinks something is wrong with the battery. The charger works well; it works faster than I've been able to check. It won't try to recharge a nearly full battery, which should help avoid damage from overcharging. Batteries slide in and out easily -- there is no lock as on the back of the camera. One minor gripe: the indicator lamps aren't labeled, so you have to guess at what's going on unless you have read the manual. Fortunately, the lights work pretty much the same way as the charging lights on the camera, and it's fairly intuitive. One warning: the LC-2J charger uses a DC adapter similar to the one supplied with the camera, but the voltage is higher. You might want to specially mark the charger's adapter so that it doesn't get plugged into the camera by mistake. The bottom line is that unless you only use one battery and don't mind tying up the camera to charge it, you will really need this charger. I would give it five stars if it was labelled better and not quite so pricey. Rated 4 out of 5 by Video Prod Specialist from Good buy for Battery Support Charging batteries on-board a camera is NOT the way to go. It's primitive and does not provide of deep cycle charging when required. The JVC JVC SSL-JVC50 Dual-Battery Charger allows for recharging the JVC-supplied IDX Camera Batteries faster, and more reliably, plus does not tie-up the camera to do it. At around $, it is a reasonably price accessory to have. A camera should be used for shooting and NOT FOR CHARGING BATTERIES!!! REALLY. Rated 5 out of 5 by Elizabeth from I waited a month for this charger... And when it came, we ran through fields of wildflowers together, holding hands and laughing like little children! Or I just plugged the sucker in, charged up my batteries FAST and thanked the B & H powers that be that it finally came. JVC 600, 650, and the new 4k line peeps learn from my fail - JVC does not include a charger with the camera... Idiot that I am, I didn't double check 'what's in the box' when buying our camera. I know backorders take a while and the email updates were a tad scatty (not weekly or bi-weekly & then I'd get 2 reminders sent same day) but I did have concerns this product was gonna be discontinued and I'd be left to plan 2-ish days for 8 hr per battery charge on the camera. But nooope! It's finally here! I think it's time for some low-tide beachfront white dress wearing slo-mo run with my new favorite piece of equipment! Rated 4 out of 5 by Reel Contact from Works Just Fine Does what it says it will do. Bit on the expensive side for a charger. But it relieves your camera of performing the duty of recharging so you are free to shoot more often without having to buy a big slew of batteries. I have three, two standard B&H# JVSSLJVC50 and one larger long lasting B&H# JVSSLJVC75 and they both charge just fine. Recharges quicker than the camera. Rated 4 out of 5 by Sir-LANC-lot from Great Charger, Horrible Price I have yet to use it simultaneously with two batteries charging, but for one it has worked great. I really like how they have a flashing led light system to give you an idea of just how full/empty your battery currently is. The only bummer is the price!! $ is just WAY TOO MUCH for a battery charger, let alone one that SHOULD already come with your camera. Rated 4 out of 5 by Barbara Baskets Studios from Set Your Camera Free 0 to 25% to Full charge on the camera takes 4 hours with charger its taking 2.5 to 3 hours. Connectors seem strong enough to last. The tandem system with unequal charges on batteries works good. All my Batteries are new so I don't expect a bad battery warning yet. Comes with all cords and the build quality seems o.k. Lost the A/C power adapter for the LC-2J, anyone knows where I can buy a replacement?